FIX UP: How Did Brianna Wu's Subpar Revolution 60 Win Action Game of the Year? FIX UP: How Did Brianna Wu’s Subpar Revolution 60 Win Action Game of the Year? Game awards are by definition subjective things. Awards are given out by sites based on the personal opinions of those doing the judging. That being said, however, normally there needs to be an objective basis from which a game being given an award can be justified. For example, if Fighter Within on Xbox One was suddenly earning Game of the Year awards in any category, that would be utter nonsense. Judging by the fact it is the lowest scored Xbox One game ever released with a mere 23/100 aggregate review score on Metacritic, we can safely say the game is horrible. So if some gaming website was calling it one of the best games of the year, nobody would take that seriously. This is why it’s so strange that Brianna Wu’s iOS game, Revolution 60, was recently awarded Action Game of the Year by iMore. There doesn’t seem to be any objective basis for it. Looking at only the facts here, Revolution 60 boasts an aggregate review score of 73/100 on Metacritic (with a laughable 3.7 user score to boot). This is described as “mixed to average reviews.” That doesn’t seem like Action Game of the Year material now does it? Maybe the game sold really well and was highly successful so that’s why it got a GoTY award right? Wrong. If you look on Facebook, the official Revolution 60 page has a mere 749 likes. That’s…not very many. iMore named a game called Leo’s Fortune as the first runner up to Revolution 60 in this category. This is odd considering Leo’s Fortune scored an 84/100 aggregate score from critics and a 7.3 user score. So not only did Leo’s Fortune score nearly 10 points higher on average from critics, it had a user score nearly TWICE that of Revolution 60. It also seems to have sold more considering it has 3,235 Facebook likes on the official page. So by all objective measures, Leo’s Fortune was a better, more successful game. How the hell did it lose out to Revolution 60 then? 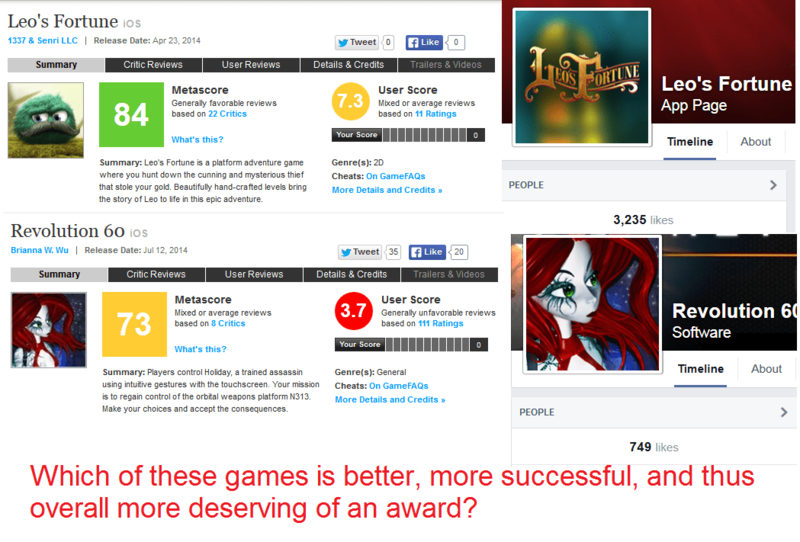 The answer, unfortunately, can be found in who judged these awards. iMore’s awards are described on their website as the “Editor Choice Awards” so let’s look at who some of the editors are. Georgia Dow is listed as one of the site’s Senior Editors. Ms. Dow is also one of four co-hosts on the Isometric show on 5by5. It is interesting to note that one of the other co-hosts on that show is Brianna Wu. It can easily be concluded by this fact alone that Dow and Wu are personal friends. 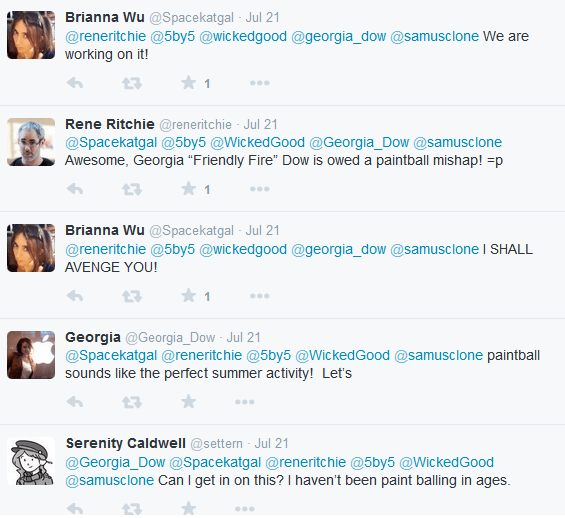 To further prove they are friends and not just co-workers, Wu and Georgia can be seen discussing getting together to play paintball last summer on Twitter. One can imagine it would probably be difficult for Ms. Dow to remain unbiased and neutral in her judging of Brianna Wu’s game. 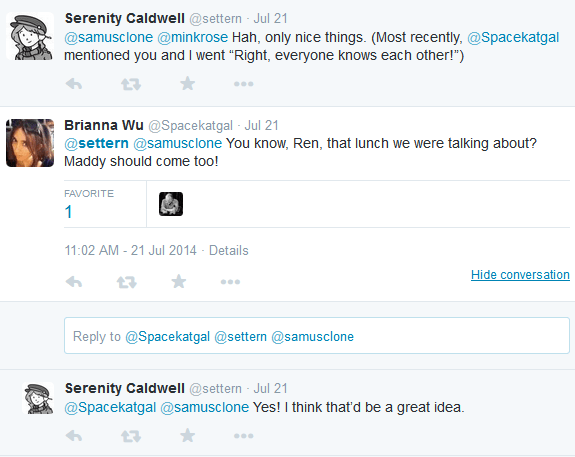 It’s also worth noting here that Rene Ritchie was involved in this discussion/activity showing that Rene also seems to be personal friends with Wu. They’re talking as if this wouldn’t be the first time they had all gotten together to play paintball (e.g. Wu screaming “I shall avenge you!”) Rene is the Editor-in-Chief of iMore. Did Rene vote in these awards as well and if so how could he possibly remain unbiased toward Revolution 60 being that he knows the creator of the game personally? There are of course other editors at iMore other than Georgia Dow and Rene Ritchie. Serenity Caldwell for example is the Managing Editor for iOS. Maybe Caldwell is more objective and helped serve as a voice of reason during the awards voting? Unfortunately it appears Caldwell also has a history with Wu. As you can see from the screenshot above, Caldwell was ALSO involved in that little paintball game discussed last summer. Both Caldwell and Wu also appeared on iMore’s “Debug” podcast episode 34 back in April to discuss sexism in tech. Georgia Dow was also part of the panel in that episode. Thus far we have shown that Brianna Wu, the head of the development studio responsible for Revolution 60 has in-depth personal relationships with iMore’s Editor-in-Chief Rene Ritchie, the Managing Editor for iOS content Serenity Caldwell, the Managing Editor for Mac content Peter Cohen, and Georgia Dow, one of the Senior Editors at the site. I’m sure these findings are only the tip of the iceberg. I have absolutely no doubt that if I were to take the time to delve into the histories of other editors at iMore, I would probably find even more personal connections between them and Brianna but the point is made. It’s pretty obvious why iMore elected to give Revolution 60, a game which was mediocre at best by all objective scoring metrics, their Action Game of the Year award. This is exactly the kind of corruption that #GamerGate is fighting to stop. Not only does this kind of nepotism in awards and reporting mislead the consumer into thinking a crappy game is better than it is, but it’s also unfair to other developers that never had a legitimate shot at winning.